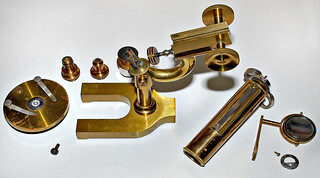 This is a partially disassembled microscope made by E.F. & F.H. Tighe, Detroit, Michigan, possibly their No. 5 version, ca 1889. It had been dropped while in its box from a height of about three feet thoroughly jamming the focusing mechanism. A friend wanted to know if it could be repaired since it has great sentimental value. The focusing mechanism was jammed to the point where it was locked, producing no tube movement, but a definite "skip" as the pinion gear engaged the rack. Fortunately, the rack is actually made from a slightly bowed piece of brass... not a thick solid piece. Anchored with screws at either end, the rack has a bit of springy flex to it, preventing gear or rack damage when forced. Getting the tube off the focusing assembly without damaging either was accomplished by directing a thin stream of hot air onto the focusing block, then precisely applying WD-40 with a blunted toothpick. 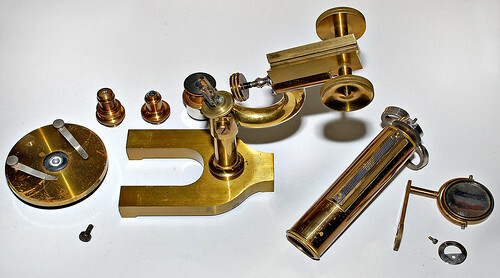 Once the tube was removed, small bits of brass were cleared away and the slides cleaned and polished. De-gunking the surfaces of the slides was difficult because they had a thin coating of hardened black grease that would not move using any kind of cleaner. Cotton swabs dipped in boiling water finally softened the stuff to the point where "Nevr-Dull" brass cleaning wool was able to do the job. Reassembled, the scope is now back in its original configuration and looks great. Some folks have been known to clean off any protective lacquer and polish the brass to a mirror finish. That would be OK if this was still in the maker's display case waiting to be sold, but would totally destroy the nice patina that 130 years of aging has produced.